At long last, Sony delivers the benchmarksetting, large-screen LCD we've felt it was capable of. Awesome. After a couple of generations in the relative wilderness, Sony has finally got the hang of this LCD TV business with its latest Bravia range. Every recent Bravia set we've tested has emerged from our labs with praise ringing in its ears. But today we're going to find out just how far Sony's talents really stretch, as we get up close and personal with the biggest Bravia set we've seen to date - the 46in 46V2000. 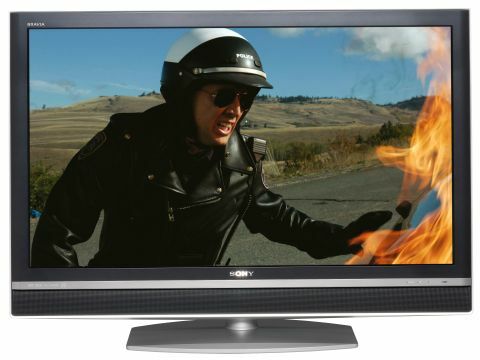 Getting up close and personal to a TV is far from a hardship when that TV is as good looking as the 46V2000. Its matt black livery with silver trim and highlights looks sophisticated and chic, while the unusual slenderness of the screen frame makes it far less dominant a presence in your living room than you might expect for a 46-incher. There's an early disappointment in store with its connections though in the form of the single HDMI input. This is depressingly limiting for a TV with so much home cinema potential. There are also only two Scarts - although thankfully both of those are RGB. At least there's some good news in the shape of a D-Sub PC socket, the must-have component video input (which is, after all, part of the HD Ready requirements), and a CI slot for adding subscription channels to what's obviously a built-in digital tuner. The 'V' in the 46V2000's name signifies that it belongs to Sony's step-up range, lying between the entry-level S series and the X series high-end offerings. This means it gains a feature over the S series in the form of Wide Colour Gamut (WCG) technology, but lacks the full HD 1,920 x 1,080 resolution and enhanced Bravia Engine EX processing of the X series. The WCG system we mentioned is a radically redesigned, new backlight system that employs improved light-emitting phosphors to deliver, reckons Sony, 127 per cent more of the PAL EBU colour range than Sony's previous sets. Hopefully this will be particularly noticeable in the reds and greens that are the perennial weak points of flat TV. Also, although the 46V2000 doesn't feature the full HD-friendly Bravia Engine EX processing of the X series, it does still carry the standard Bravia Engine system that's performed so admirably on previous new Bravias. In case you missed those earlier reviews, Bravia Engine is the first picture processing engine Sony has designed exclusively for LCD technology, with no compromises for plasma or CRT. Its key chores include adding detail, reducing all types of video noise and enhancing colours. Another key feature the 46V2000 shares with the new Bravia range as a whole is Super Vertical Pattern Alignment (SPVA). This describes a new pixel design that allows the picture to retain much more genuine integrity over a much wider viewing angle than would otherwise be the case. Getting slightly more prosaic, the TV's tidy onscreen menus include superbly well-presented, seven-day electronic programme guide support, noise reduction options, a contrast boosting option, gamma correction should you not be happy with the colour tone and shadow detailing during dark scenes, colour space adjustment, and an option to ramp up peak whites. All in all, the 46V2000 ticks pretty much all the really important feature boxes - except for the twin HDMI one, that is. And so to the $64,000 question - are Sony's latest technologies really up to the job of supporting pictures on a screen as big as 46in across? Indeed they are. In fact, we'd go so far as to argue that the bigger screen size actually shows the technologies off in their best light. This is certainly true when it comes to fine detailing and general sharpness levels. The amount that the 46V2000 manages to portray during HD viewing is nothing short of jaw-dropping, and actually carries far more impact at this elevated screen size than it does even on Sony's 40in screens. So powerful is the HD sharpness that sometimes you'd swear you were looking through a window at a living, three-dimensional world. Some of the finest black levels we've seen on an LCD TV add scale and dynamism to this already impressive picture. Almost gone is the greyness over dark areas that blighted Sony's previous Bravia LCD generations, and, remarkably, the detail even extends into the darkest corners, filling them with the sort of extensive, subtle shadow detail that brings dark scenes to life. The breadth, subtlety and sheer expressiveness of the 46V2000's colour palette also makes a considerable mark, giving pictures that all-important, but hard to achieve, combination of dramatic colour richness and totally authentic tones. The WCG technology means the 46V2000 is even better than Sony's S range in this department. There's also little evidence of the motion smearing that affected previous Bravia generations, and the fact that you really can watch it from quite a wide angle before the picture deteriorates, makes it small wonder that Bravias are being used in most shops for showing off HD. The only snags we can find with the 46V2000's pictures are a slightly orange look to some red tones and a tendency for some standard-def sources to look a touch noisy. The 46V2000's talents aren't restricted to pictures, either. Audio performance is remarkably powerful too, delivering a soundstage stuffed with bass, widely dispersed, expressively open in the mid-range, and possessed of unusually rich, well-rounded trebles that avoid all traces of harshness. Another outstanding Sony Bravia TV. In fact, it's our favourite Bravia yet - and that's saying something.